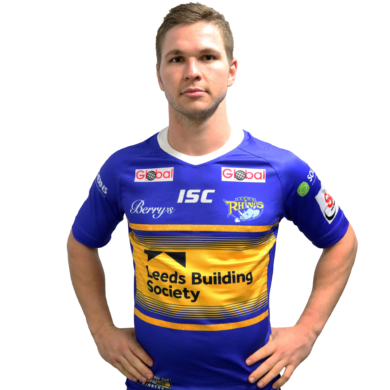 Matt Parcell joined the Rhinos on a three-year contract from NRL side Manly Sea Eagles and made his debut on the opening day of the season against St Helens. He was one of the stars of the Rhinos team during 2017, he scored 17 tries in 31 appearances, finished runner up in the player of the season awards and won his first Super League title and was the only Rhinos player named in the Super League Dream team. A highly rated youngster, he gave up a career in civil engineering in 2014 to pursue his dream of playing Rugby League professionally with Brisbane Broncos. A move to Manly Sea Eagles followed in 2016 where he played 15 games last season in the NRL. In 2015, he was played under former Leeds half back Ben Walker at the highly impressive Ipswich Jets. Having made six appearances for the Broncos earlier in the season, he opted to return to his home town club to gain game time. The move proved decisive as he helped the Jets win their inaugural Intrust Super Cup title and ended his five year career with them on a high note. The Jets gained a reputation for their attack-minded style of play, which Parcell was at the heart of scoring eight tries from three games, including five against the Easts Tigers in the Week Two elimination final. The Fassifern Bombers junior made six NRL appearances for Brisbane before joining Manly this season. Parcell will follow in the footsteps of his grandfather Gary Parcell when he runs out at Headingley Carnegie for the first time. Prop Gary Parcell toured with the 1959 Kangaroos and played against Leeds and Great Britain at Headingley nearly 60 years ago. His great-grandfather Percy Parcell represented Queensland as a rugged forward, his grandfather Gary represented Australia in eight Tests and alongside Noel Kelly and Dud Beattie formed an all-Ipswich Australian front row from 1959-62, while another relative, Hector Gee, scored twice in the infamous 1932 Battle of Brisbane Test against Great Britain. His father, Steve, captained the Ipswich Jets and played alongside the likes of Allan Langer, Kerrod and Kevin Walters under Tommy Raudonikis in the 1980s.